Ellipsometry is a very sensitive optical technique which provides unequaled capabilities for thin film metrology. Ellipsometry exploits phase information and polarization state of light and so can achieve angstrom level resolution. 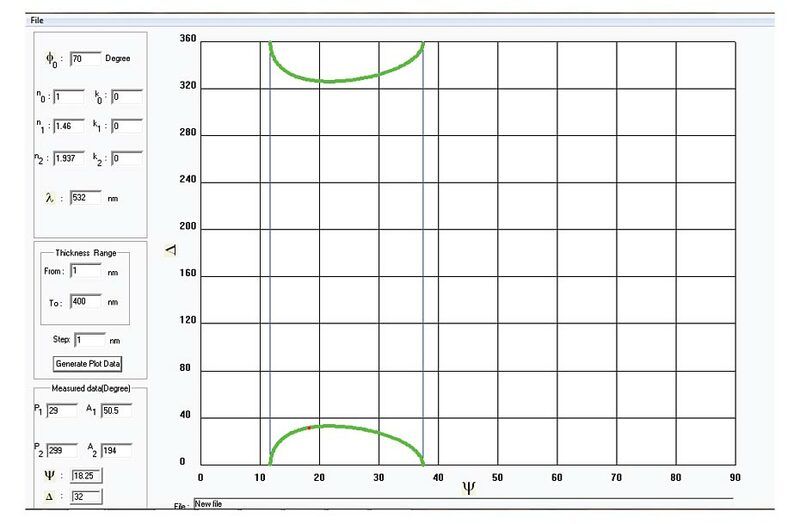 The main advantages of ellipsometry are its non-destructive character, high sensitivity and wide measurement range. 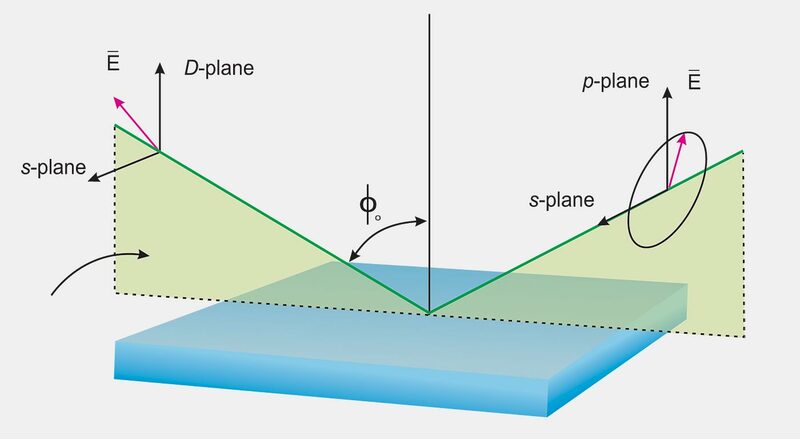 The optical parameters like thickness and refractive indices of a thin film can be determined precisely by this technique. In the ellipsometer model no: HO-ED-P-06, a circularly polarized light is made incident on the test substrate and the reflected light which is linearly polarized is analyzed for polarization changes. The instrument consists of two concentrically rotating arms around a precisely graduated disc fixed to a heavy base. A laser source is held on one arm and the detector assembly on the other arm. The graduated disc has 1° scale and 0.1° resolution achieved through a vernier. Power supplies for laser source and detector are placed separately. 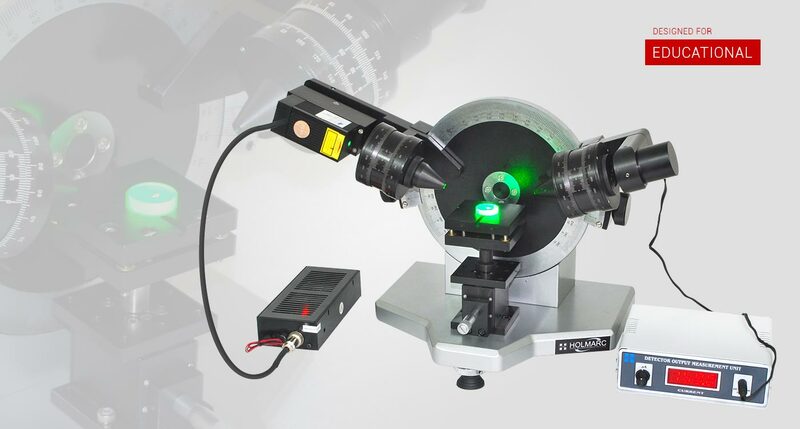 Polarizer, analyzer and quarter wave plate are held in precision rotary stages in the optical path with precise graduations having 0 - 360° range and 0.1° resolution. Glan-Thompson Prisms are used for both polarizer and analyzer. Sample is placed on a precision micrometer driven vertical stage with height adjustment range of 10 mm and resolution 0.01 mm. Incident angle for laser source can be adjusted between 30° and 90°. For null method, detector can be replaced with a miniature screen for visual determination of null point, if required. As shown in the Fig., randomly polarized laser light (532nm) passes through a polarizer which changes the polarization of light from random polarization to linear polarization. The linearly polarized light then passes through a quarter-wave plate (set the fast axis at 45 degree) which changes the polarization state from linear to circular. After reflection from the sample thin film, the circularly polarized light becomes linearly polarized and an analyzer measures the degree of polarization.